Mexico City Policy: Putting the US at odds with the EU? The London Family Planning summit has reportedly documented $5 billion in pledges to aid family planning services in developing nations, however, will the policies of the Trump administration hinder these efforts? 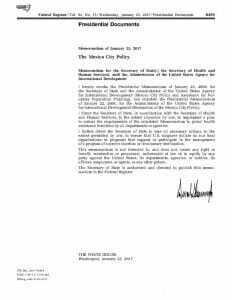 President Trump’s memorandum restoring and expanding the Mexico City policy. On Tuesday, July 11, World Population Day was observed, with a timely theme: “Family Planning: Empowering People, Developing Nations.” This served as a reminder of how important family planning is to international (and individual) development – and painfully brought to attention how precarious the situation surrounding family planning and reproductive rights currently is. A major blow was dealt to family planning on the international level earlier this year, when U.S. President Donald Trump restored the Mexico City Policy on January 23. Also known as the global gag rule, the Mexico City policy was first implemented during the presidency of Ronald Reagan. It prevents non-government organisations (NGOs) from receiving U.S. family planning funding if they “perform or actively promote abortion as a method of family planning.” This is no matter where those funds come from, be it from countries other than the U.S. or even the organisation’s own funds. It is worth noting that U.S. funding cannot be used to provide abortion services anyway, by virtue of the 1973 Helms Amendment to the Foreign Assistance Act. Trump’s reinstatement of the policy was not unexpected; every Republican President since Reagan has put the policy in place (likewise, every Democratic President has rescinded it.) The move has however further strained international relations, particularly with EU nations, who are moving to fill the void in international funding. The policy has been strictly applied along party lines in all but one occasion. Under Bill Clinton, during his final year as President, the policy was put in place by Congress. The application of the policy by Congress has only occurred once, in which a modified version was put in place legislatively as part of a broader arrangement in order to pay back US debt to the United Nations. The last incarnation of the policy, under President George W Bush, used the same draft policy as previous Republican Presidents Ronald Reagan and George HW Bush. The policy applied only to funds received from US government global family planning assistance, currently worth a total of approximately $600 million (as of 2017). President Trump, however, has expanded the scope of the policy – and its effects will be more widely felt as a result. What makes Trump’s version of the policy far more dangerous to global health initiatives is his expansion of the policy to cover not just family planning assistance, but the US global health assistance funds as well. This brings the total funds covered by the gag rule from around $600 million, to an estimated $8.8 billion. The potential reduction in funds that this represents for NGOs working primarily in healthcare assistance in impoverished nations is catastrophic. As the policy still applies to NGOs that provide abortion using funds from any source, this could result in the mass defunding of a large number of organisations. President Trump’s defunding of US backed global healthcare initiatives is on an unprecedented scale. The areas affected are numerous: funding support for family planning and reproductive health will be reduced, as will maternal and child health, nutrition, infectious diseases, neglected tropical diseases, water, sanitation, and hygiene programs. Even Republican policies (from the Bush presidency) are facing a proposed cut in funds, including the President’s Plan for Emergency Relief for AIDS (PEPFAR) as well as the President’s Malaria Initiative. Experts are concerned that targets to provide access to family planning services and modern contraception to 120 million women and girls by 2020 will be made more difficult by the expansion of the policy. The targets, set in 2015, are already behind schedule: of the 50 million that were required to have been reached by this year, so far only 30 million have been provided for. As the US is the largest donor in terms of foreign health donations, any cuts are likely to undermine global healthcare progress, with a disproportionate effect in poverty stricken regions. Cutting funding to global family planning services is estimated to reduce access to contraception in around 60 low and middle income countries. This hugely limits the ability of women to plan pregnancies, or to increase the time between pregnancies to focus on matters such as furthering their career. Many politicians have criticised the decision to both reimplement the Mexico City Policy, as well as expand it. At the “She decides” conference in Brussels a number of attending politicians commented on the policy. The International development minister of Sweden cited data from the World Health Organization that show that the previous implementation of the policy under George W Bush actually led to more abortions and maternal deaths from unsafe terminations. The data plots out the abortion rate per 10,000 women in 20 Sub-Saharan nations over the period of 1994 to 2008. The findings indicate a clear trend that demonstrates that during the Clinton Presidency, in which the Mexico City Policy was not in effect, the abortion rate remained steady in these countries. However, once the policy was resumed under Bush, the abortion rate showed a gradual increase until the end of the study in 2008. 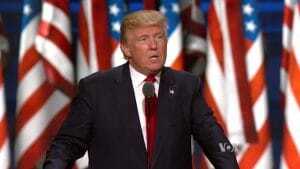 Some groups have suggested that condemnation over the policy has been drowned out by Trump’s other activity on the world stage, as well as cuts to other areas of global aid and the withdrawal from the Paris Agreement. Melinda Gates — who, herself, is opposed to abortion — challenged the expansion of the policy, stating that the broader implications of the policy would damage global reproductive health organisations. Her primary concern lay with the fact that the policy defunds organisations which use funds other than those from the US for abortions. This forces NGO’s to decide between abandoning the provision of safe abortion, or losing potentially huge amounts of funding. EU to pick up the slack? Organisers of the She decides conference aimed to raise $600 million at the event. Though this total was not reached, with a final sum reaching only $182 million, the event did gather the support of many EU nations. Since the event, Sweden has pledged to deny financial support to any NGO that abides by the Mexico City Policy. This has added yet another layer of controversy, as well as made the acquisition of funds, and the choices made by NGO’s in what services they may support, far more complex. While the move may be an attempt to press for women’s reproductive rights, in practice it may be detrimental. Sweden’s policy forces the choice for NGOs, either funding from the US or from Sweden. The US can put forward far more financial aid than Sweden (Sweden putting forward only 170 million Swedish Kronor , roughly $20.1 million, in additional funds), this makes funding from the US a far more attractive option and so could have the adverse effect of leading to some organisations abandoning their safe abortion initiatives. Political point scoring will do little to alleviate the potential burdens that impoverished nations will be forced to endure. As shown by WHO data, abortions, many of which are unsafe and can be fatal, rise when the Mexico City Policy is in place. For other nations to threaten defunding over abortion stance is likely to only worsen the situation.